Time to start that vinyl habit. There's no doubting the vinyl resurgence, and this year's CES has a few turntable options for those hobbyists. 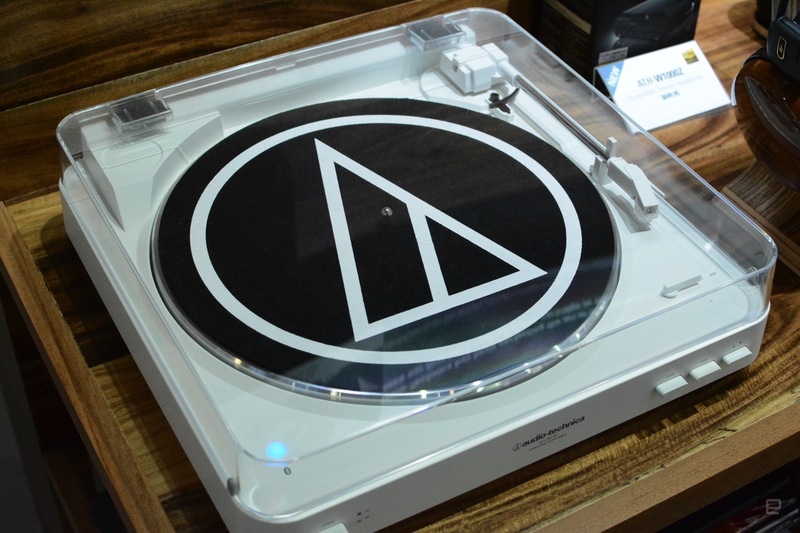 In addition to Sony's new model that digitizes vinyl tunes and a Technics revival, Audio-Technica has a turntable for your wireless speaker setup. The company's AT-LP60-BT offers Bluetooth connectivity in a fully automatic belt-drive stereo turntable. This means that in addition to speakers, you can also pair the device with your wireless headphones (more on that in a second). You can connect up to eight different speakers as well, which would seem to make it a solid option for multi-room audio. However, we'd want to test the range before confirming you can use it in that manner. The AT-LP60-BT also features automatic operation as the arm is placed or removed from the record simply by hitting the start or stop button. There's also a lift button that removes the arm without stopping the record from spinning. Additional controls include a speed selector (33 or 45 RPM) and a size selector for 7- and 12-inch vinyl. Should the need arise, the turntable also has an RCA jack for analog output. You know, in case you want the good ol' wired connection. What Audio-Technica's new unit lacks, however, is a USB connection. At $180, the AT-LP60-BT allows you to connect to a Bluetooth speaker you likely already own. Of course, sound quality will vary based on the quality of the speakers or headphones you're connecting. And yes, audiophiles will want to look for a wired connection to get all of the benefits that vinyl offers. That being said, I gave the turntable a listen with a pair of Audio-Technica's ATH-S700BT cans. Based on a couple minutes of an Adele track, I can say that setup sounded pretty good. I'll reserve a final judgement until I'm in the quiet confines of home with a robust speaker setup, as I see that being the most common use case. What the AT-LP60-BT does provide, though, is convenience. Eliminating the need for a full-on console to power a turntable and send the sound to a set of home theater speakers is an attractive option. Audio-Technica isn't the first company to do pack in Bluetooth, as Ion recently released a wireless model, too. These new wireless turntables will entice me to start a vinyl habit, though, that's for sure.